My sister has a problem. A kimchi problem. 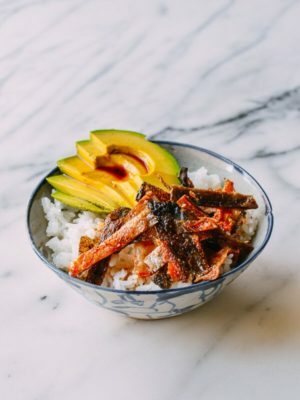 She does this thing, where she walks into our local Korean-run market after work, walks straight to the back of the refrigerated aisle, and buys way too much kimchi for her own good––more than she will ever actually eat with her rice during the week. So what is an older sister/roommate to do when there’s a container and a half of kimchi languishing on the top shelf of the fridge, with no immediate use in sight? 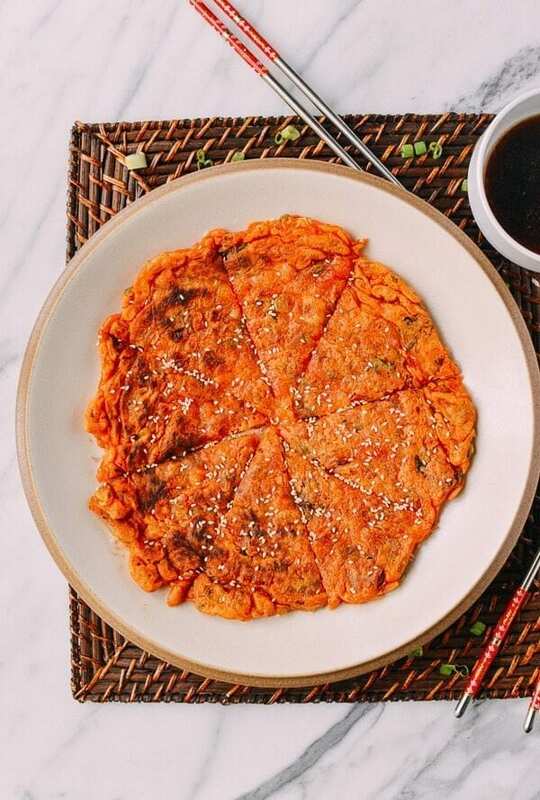 Make kimchi pancakes, that’s what. 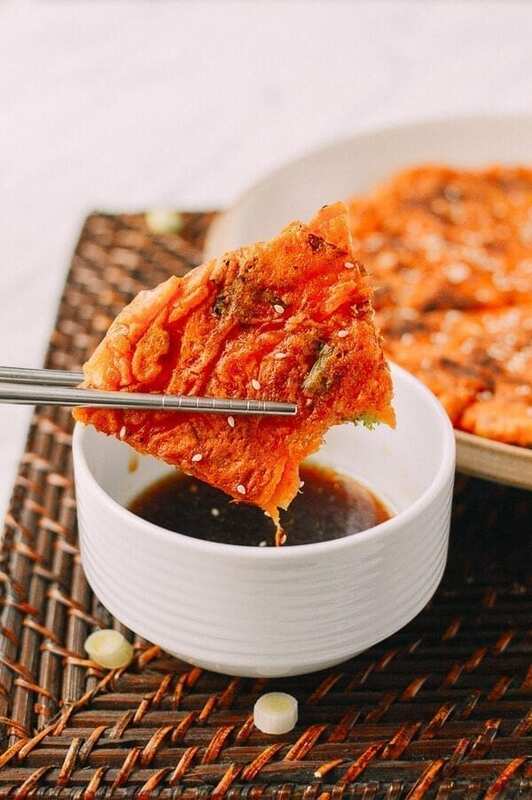 Kimchi pancakes (aka kimchijeon) are as easy to make as their breakfast/serve-with-maple-syrup counterparts. 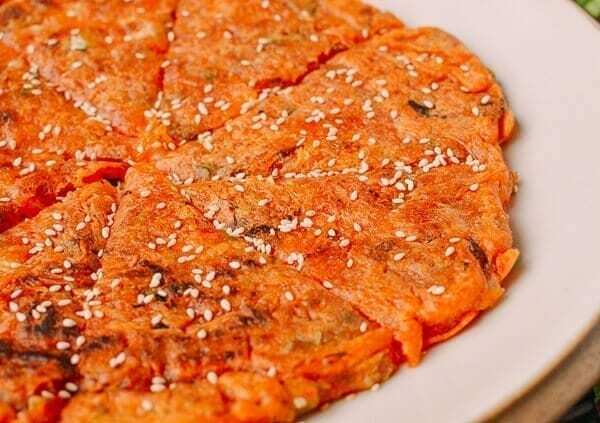 Unlike Chinese scallion pancakes, which require you to make a dough, kimchi pancakes are made from a simple batter. Regular ol’ all purpose flour is your starting point. If you can find it, the addition of potato starch gives the pancakes extra crispiness (that said, if you can’t find potato starch, you can just substitute more all-purpose flour, no problem). 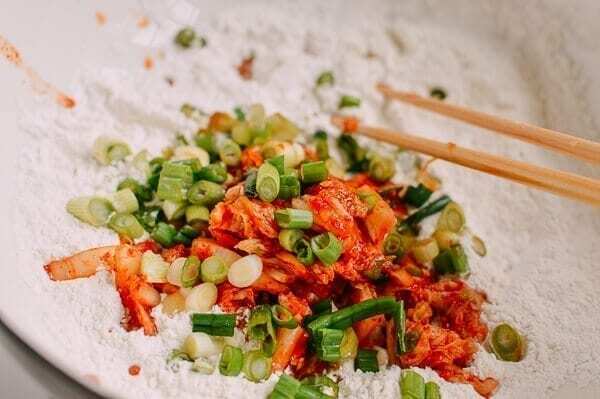 From there, you just chop up some kimchi and add it in––kimchi juice and all––along with some scallions, salt, and a little water to loosen it up. 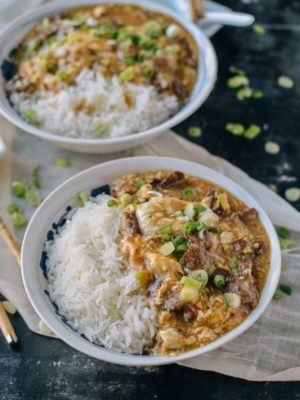 After a quick little mixeroo with your chopsticks or a fork, you fry it up for a few minutes in the skillet, and you’re done! 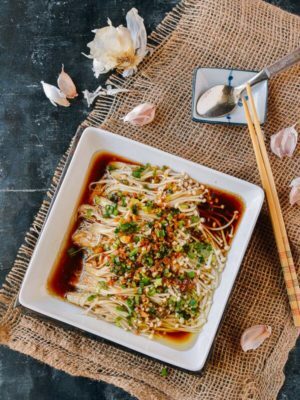 If you want, you can also serve it with a dipping sauce, which is even easier to pull together––it’s just soy sauce, water, a little sugar, and rice vinegar. 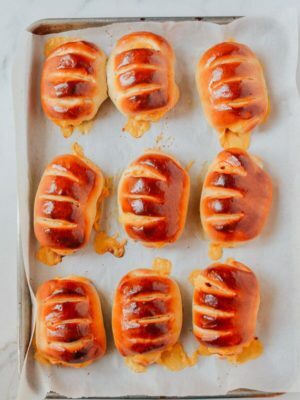 It’s the perfect quick appetizer, and I find myself making it on weeknights when I stagger into my apartment after a long workday and need something to eat FAST. 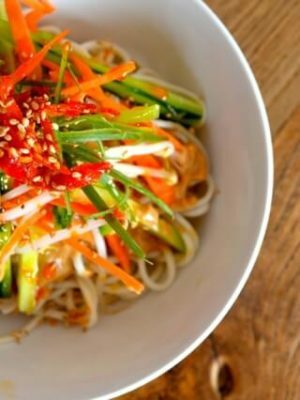 Plus, it’s the perfect way to make sure no kimchi goes to waste. 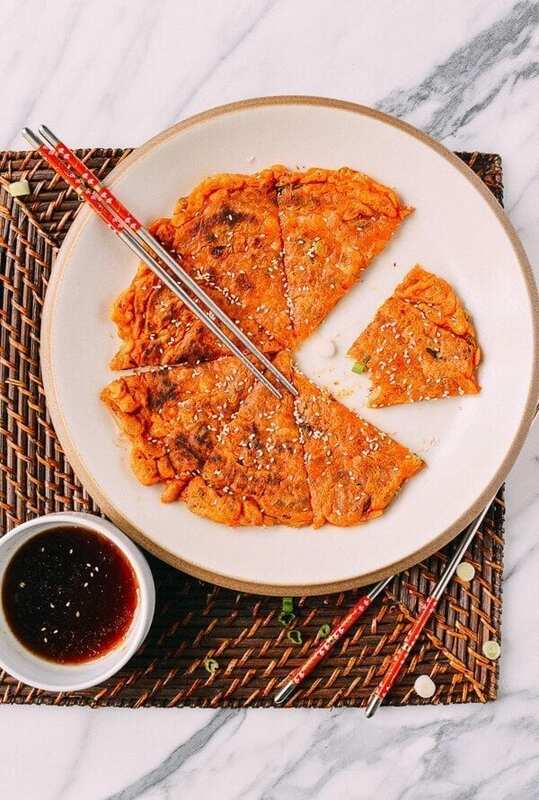 Now, you can use Store-bought Korean pancake mix, but why use that store-bought stuff when you can make your own homemade Korean pancakes from scratch? 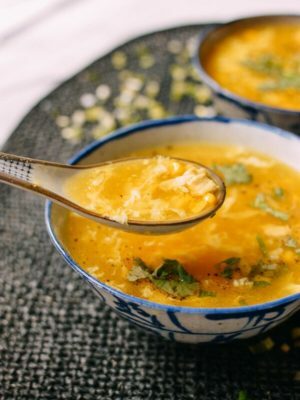 Store-bought versions usually have added flavorings and preservatives, but in your homemade version, you know exactly what you’re putting in. In a large bowl, combine the flour, potato starch, and salt until combined. Add the kimchi, kimchi juice, water, and scallion. 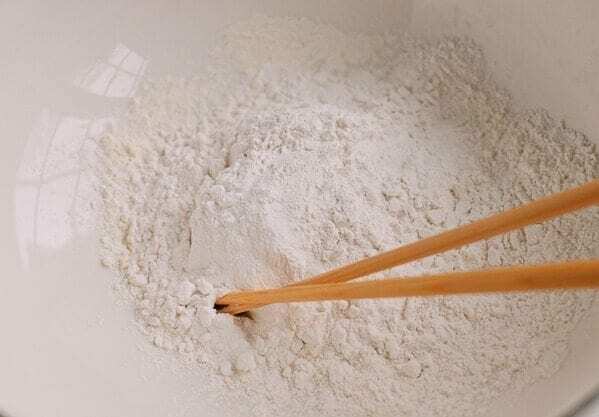 Use a pair of chopsticks or a fork to stir the mixture until well-combined. 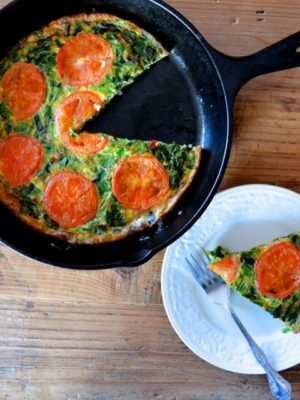 Heat a nonstick or cast iron pan over medium high heat. Add 2 tablespoons vegetable oil and add the batter to the pan, spreading it in an even layer. Fry until browned on one side. Flip the pancake and continue to cook until browned on the other side. 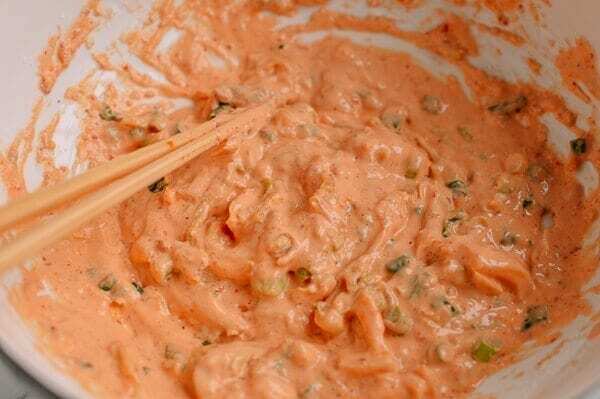 Meanwhile, assemble the dipping sauce by combining the sauce ingredients in a small bowl. 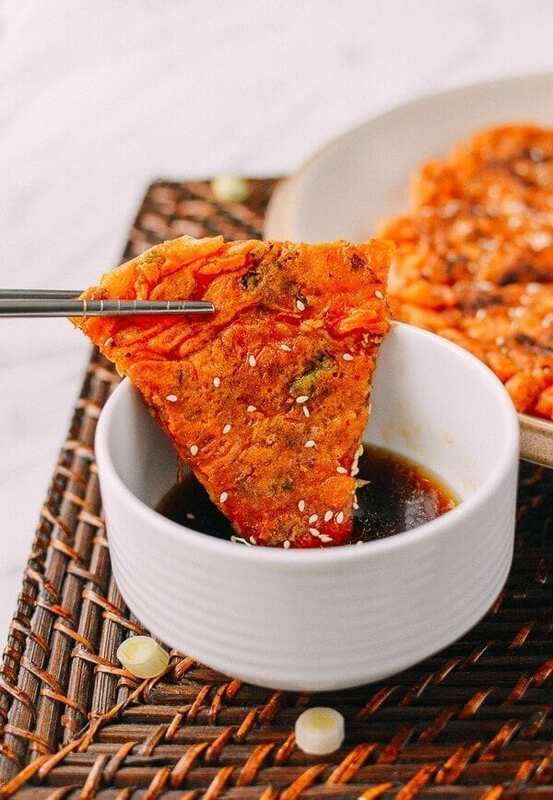 Serve alongside your kimchi pancake! 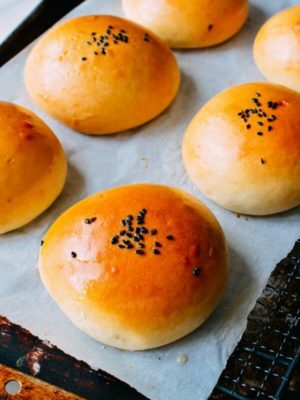 If you want a little extra nuttiness (and fanciness), you can sprinkle the pancake with toasted sesame seeds. In a large bowl, combine the flour, potato starch, and salt until combined. Add the kimchi, kimchi juice, water, and scallion. 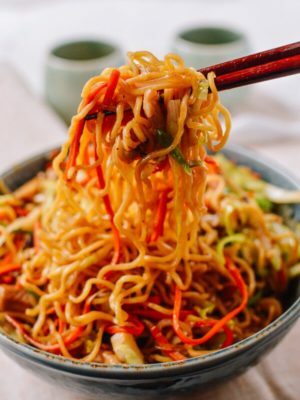 Use a pair of chopsticks or a fork to stir the mixture until well-combined. 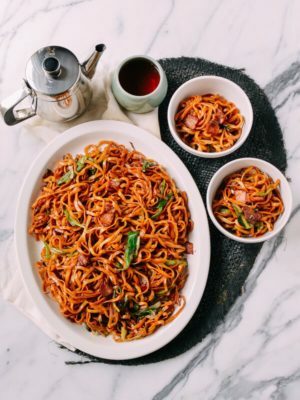 Heat a nonstick or cast iron pan over medium high heat. Add 2 tablespoons vegetable oil and add the batter to the pan, spreading it in an even layer. Fry until browned on one side. Flip the pancake and continue to cook until browned on the other side. Meanwhile, assemble the dipping sauce by combining the sauce ingredients in a small bowl. Serve alongside the pancake! 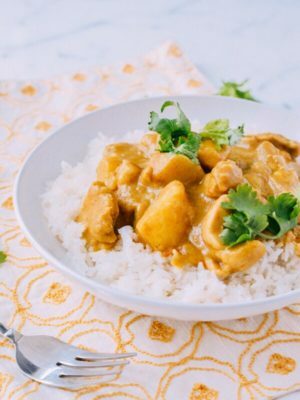 Is it possible for me to replace potato starch with cornstarch? Hi Dee, I think that should work. Potato starch makes things a little crispier than cornstarch, so the texture will be a little different, but it’ll still be good. 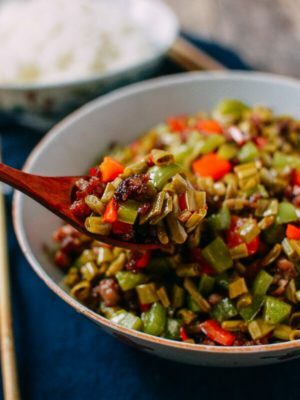 I just want to say thank you for this recipe! I was craving something like okonomiyaki but with heat (and flour) and this was an awesome way to use some of my 1.5L of Kimchi (I totally understand your sister). 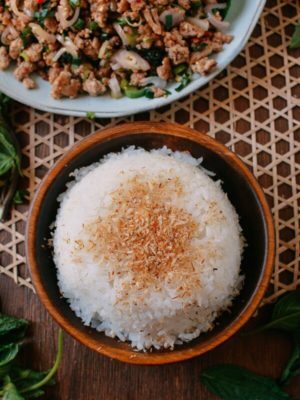 Such a delicious, fast and cheap dinner! I will definitely make this many more times. Thanks muchly. You’re welcome, Sarah. 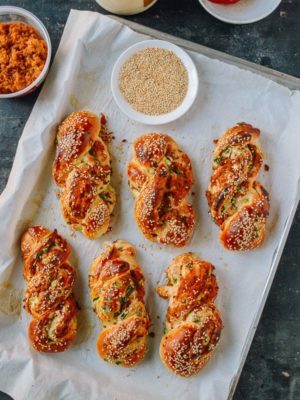 Glad this recipe could help satiate your cravings while also using up some of your kimchi stockpile! Just tried to make this today; flavour was there but it was too gummy. I think I might have mixed the flour (only all purpose) too much because I already had to add water to make it remotely pourable. Next time I might try adding flour after everything else so I can adjust more easily. Thanks for sharing the recipe. Thanks for the feedback, Laura! 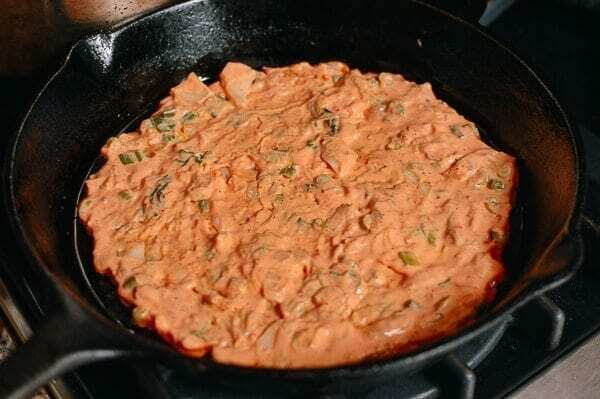 There is some variation across kimchi pancake recipes when it comes to how runny or not the batter is. I actually like my pancakes a bit chewier, while also being crisp on the outside. My grandma actually taught me (when making pancakes similar to this) to stir the mixture MORE to develop gluten and make them chewier. All comes down to personal preference! The types of flour make a really big difference. Potato starch is worth hunting out. (And it makes the most amazing fried chicken ever!) i still need go make this one! AND i have all the ingredients! This turned out great, thank you! I made it more like a complete meal by putting some baby greens (mustard, in my case) and a fried egg on top, then drizzling the sauce over it. Makes it very pretty, too! 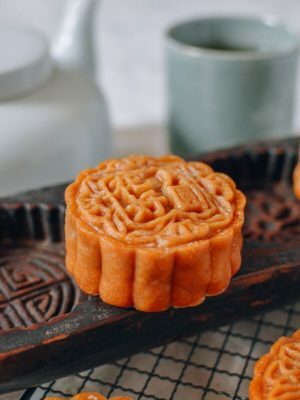 I’ve tried using rice flour instead of potato starch and it’s very crispy that way. 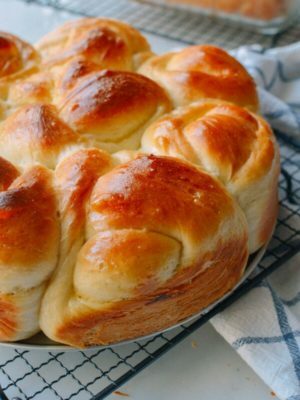 Great easy recipe! 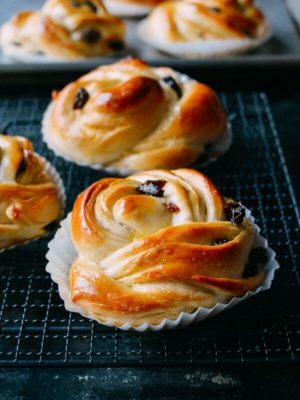 Hey Yana, havne’t tried using gluten-free flour for these, so I’m not sure. I do have friends and family with gluten allergies so I should definitely look into this more. Let me know how it goes if you try it! How much sugar do you put in the sauce? 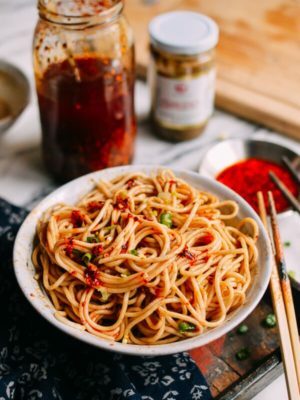 Whoops, i can’t believe we forgot to include that in the sauce recipe! I’ve since fixed it. You can add sugar to taste, but I usually do about a teaspoon.